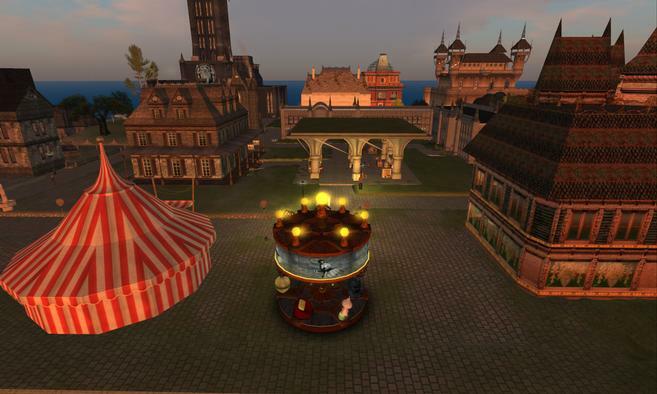 Players: Fianah Mistwood as Miss Tickta, jkl7008 Trevellion as DJ JKL7008, Kitiarafox Resident as Kit, BilliAnn Bravin as Lady Wilhelmina Bravin, peacelynxtree Resident as Lynx, Emmett Lacombe as Brom Xavier Bloodsworth, QuarkZen Resident as Miss Zen Katria, Aria Bloodsworth Resident as Aria Bloodsworth, Jhaesoph Foxdale, Asil Karu, Kaelyn001 Resident as Kaelyn, OhDearMe Resident as OhDearMe Ohmai, and Treyhem Whitfield as Treyhem Sleipnerson. HISTORY: Often sponsored by local veteran associations, “Clockwerk Galas” are very popular affairs, serving as fund-raisers and recruitment. The most amazing is held every Fall in Old London on Old Earth, it runs a fortnight with the oldest houses vying to raise the most money with fantastical parties and auctions. 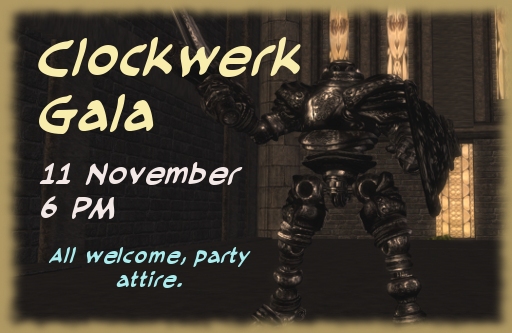 The “Royal Clockwerk Ball” closes the festivities; its held in Buckingham Slithen and all the Court attends. Here the valiant of the year’s warriors are awarded the Sidhe Cross. Synopsis: Miss Tickta returns to NeoLondon, after a mysterious time away. She and Kit have dressed the Cathedral with an amazing light-show, controlled by a DJ with magical powers. The townfolk meet her companions: Brom Xavier Bloodsworth and his sister, Aria. Toasts are given. Funds are raised. The evening ends with a flying dance.